I am attempting to boot from a USB Key in UEFI mode to dual boot windows 8 and arch linux. I'm unsuccessful in getting the USB key to boot in UEFI mode. I am following the guide on page: https://wiki.archlinux.org/index.php/Un … _Interface due to the fact that I am receiving error " No loader found. Configuration files in /loader/entries/*.conf are needed." However, I'm stuck on the initial step from the wiki: Install refind-efi pkg. In the usb's filesystem, overwrite the file EFI/boot/bootx64.efi with /usr/lib/refind/refind_x64.efi. My question is: How do I install the refind-efi package onto the USB key using an arch linux host machine and the USB plugged into the machine. You don't need to install refind-efi on the USB key, only on your arch linux host machine. The only purpose is to have /usr/lib/refind/refind_x64.efi available from your host system, so that you can copy it to EFI/boot/bootx64.efi on the USB key. Thanks, I now have the USB key booting via UEFI and using refind. However, when I choose the #1 option in refind to boot from the USB key nothing happens. default_selection "Arch Linux Archiso x86_64 UEFI USB"
options "pci=nocrs add_efi_memmap archisobasedir=arch archisolabel=ARCH_201210"
When I choose this option I just get a blank screen and then the computer does nothing else. 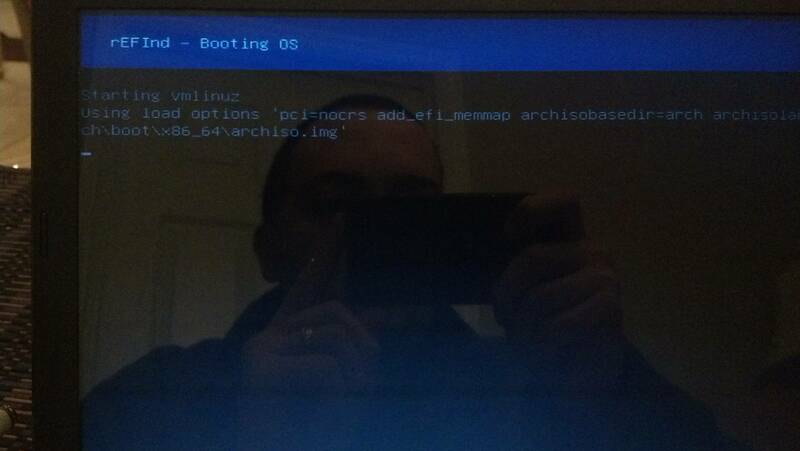 Could it be the vmlinuz-arch.efi file? Does "archisolabel=ARCH_201210" from your refind.conf match the label of your usb key? If not it won't work. The correct label needed to be "archiso". I changed that in refind.conf and am still experiencing the same issue. Hm, just to be clear - what other options are available? Is there an uefi option? Try installing another boot loader, such as ELILO, GRUB 2, or Fedora's patched GRUB Legacy (not another boot manager, such as gummiboot), and use it to launch the kernel. It's conceivable that you've got one of the rare cases in which the EFI stub loader isn't working but something else will work. For testing purposes, ELILO and Fedora's patched GRUB Legacy are the simplest to install and configure; however, I don't think either is available via pacman. See my EFI Boot Loaders for Linux page for download links. I installed the AUR version of GRUB2 ( grub-efi-x86_64-bzr ) using yaourt. After Loading initial ramdisk the computer simply freezes and requires me to press the power button. Anyone have suggestions that can help me get this laptop working? 1. Might be possible, that the uefi integration is pretty bad. Have you already looked for an update of the uefi bios? 2. In your first posting you mention Windows 8 on this machine. Is W8 starting in uefi mode? 3. If W8 is starting in uefi mode, are you sure that secure boot is disabled? ... by the way - what kind of laptop is it? This is my thought, too. The "memory map has changed" message sounds like the firmware is messing with the way memory is laid out in the middle of the boot process. A firmware update, if available, is likely to be the best way to deal with this problem. If not, trying Fedora's patched GRUB Legacy and GRUB 2 are also worth doing; it's conceivable that one of them includes a workaround for the problem. This is important, but if the disk uses GPT partitioning, then Windows is starting in EFI mode. It is; if it weren't, neither rEFInd nor ELILO could start -- or even if they were configured to start in Secure Boot mode, ELILO doesn't launch its kernels in a way that respects Secure Boot, so the ELILO failure can't be caused by Secure Boot. Also, when launched with Secure Boot active, rEFInd returns a clear error message about a security violation and then returns to its main menu; it doesn't hang the computer. Create a BIOS Boot Partition on the disk. Install the BIOS version of GRUB 2. Configure rEFInd to include a scan for BIOS-mode boot loaders by uncommenting the "scanfor" line in refind.conf and adding "hdbios" to it. Thereafter, you'll see a new "generic" icon, which should launch GRUB, which should launch Linux in BIOS mode, even though Windows launches in EFI mode. This will work on most modern UEFI-based computers with a single hard disk, but things get trickier with multiple disks and with some UEFI implementations that lack the necessary firmware features. If a future firmware update fixes the problem, or if a future kernel's EFI stub loader includes a workaround, the EFI-mode booting will become an option once again. The laptop is an ASUS X401A -- Updating the BIOS worked, I can now utilize rEFInd to boot into Windows 8 and Linux.